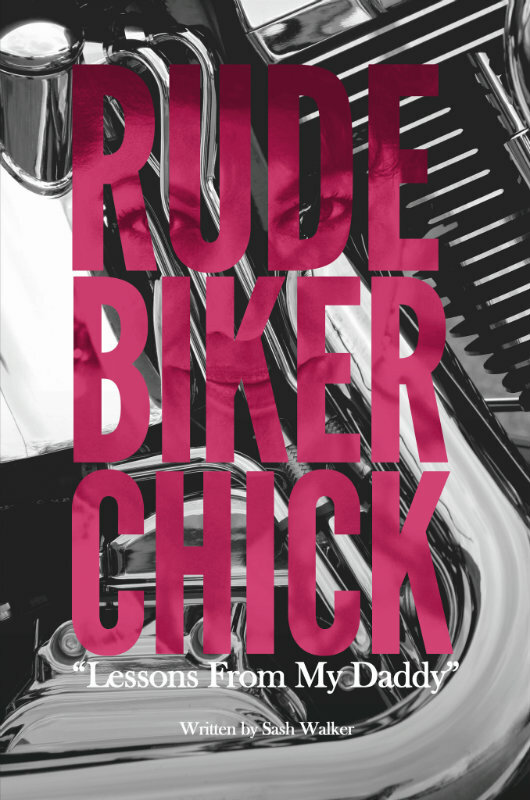 Back on Valentine's Day, Sash released her book, "Rude Biker Chick: Lessons From My Daddy", now available as an e-Book for Kindle and Nook readers, as well as in other electronic formats. She started writing it last year during Road Pickle 2014. But the idea for a book started long before that. In 2011, she was inspired by a song she heard on the radio, and it completely turned her life around. She went on to win the title of "Ms. Menifee", a suburb in Riverside County, CA where the each of us were living at the time. She was feeling so much positivity within herself, other women sought advice from her on how to turn their lives around too. For a while, Sash entertained the idea of becoming a motivational speaker. She attended some conferences and workshops, and even got to do some of her own gigs. That's when she realized she needed to author a book. But writing a self-help book became an uninspiring chore. A year went by, and in 2012 we launched "Too Much Tina" our present-day marketing and media business. Sash no longer wanted to do the motivational speaking circuit, and discovered she has more fun and productivity with her person-to-person skills. But the idea of writing a book was something she still wanted to do. In April 2013, she and I did our first Road Pickle trip, where we rode our motorcycles across the country, going through 26 states over a 6-month period. She met so many people, many of them were existing clients, and some of them became new clients. She also met her uncle Reggie, who taught her a lot about her ancestry. The exposure to so many cultures and ways of thinking, opened up her mind and really changed her. After attending the Steel Horse Sisterhood Summit in May 2014, she finally found inspiration to write her book. It would be a description of two journeys happening simultaneously. One is the 6-month Road Pickle tour of the United States, the other is a road to enlightenment. The latter starts from churning up all the pain from her abusive childhood, past marriage, and a father/daughter relationship that remained elusive. Along the tour, however, she remembers the wealth of wisdom her father left her with, and realized how it all made sense after thousands of miles seated on her motorcycle. The book combines actual situations she found herself along the tour, and relates them to her father's words. Even though Sash's father died in 1990, she's developed a closer relationship with him now than ever before. Her father was heavily involved in the 1%er motorcycle culture of the 1960s, 70s, and 80s. "Rude Biker Chick" is in some ways, a daughter's homage to her 1%er father, and not just the story of how Tina became Sash. So very cool she is now a published author. Congrats to Tina!